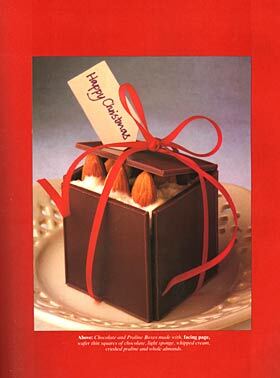 This is exactly how the recipe appeared in A La Carte Magazine December 1985. All the quantities and measurements are given the old fashioned way and I’m certainly not prepared to work out the metric version for you! If you are mad enough to make these I am confident that you have the gumption to work it out yourself. First make the sponge: whisk together the eggs and sugar until pale and thick, then fold in the flour and butter alternately. Pour into a prepared 8 in square cake tin and bake at Gas Mark 7 (220 C, 425 F) for 8 – 10 minutes. Allow to cool slightly, then turn on to a wire rack. To make the praline: place the sugar and almonds in a heavy saucepan. Cook gently until the sugar starts to melt. Stirring occasionally, allow to bubble until the sugar caramelises and the nuts begin to “pop”. Pour on to a lightly oiled baking sheet and cool. When cold, grind coarsely. Fold the cream into the praline. To assemble: cut the sponge into 6 x 1 in squares. Place 1 chocolate square on a piece of greaseproof paper and brush with apricot jam. Top with a piece of sponge. Brush the sides of the sponge with apricot jam and press 1 chocolate square on to each side. Spoon some of the praline cream on to the sponge and decorate with 6 almonds. Rest a square of chocolate on top to form a lid. Repeat the process with the other 5 pieces of sponge. Finally, tie a thin red ribbon round each box.